People choose to express their love to those who matter in their lives in all sorts of ways – some traditional, some modern, and some just far out – but there is one symbol of our love that never goes out of style – the ring. Perhaps more than anything else, we use rings to embody our feelings for others. Engagement and wedding rings, commitment rings, anniversary rings, friendship rings – these little circles symbolize eternity with no beginning or end, just the way we want love to be. Choosing a ring for a loved one can be a nerve-wracking experience, and the endless variety of choices can make it even more of an endurance test. How to pick from the hundreds and hundreds of rings on display at your local jewelers? But there’s another option to the mass market ring, which is to have a jeweler design a custom ring just for your loved one. Custom rings give you the opportunity to create a dream ring, one that will have greater meaning and importance to the wearer for a lifetime. For the past 25 years, Paradise City Arts Festivals’ jewelers have created unique rings of love and commitment to celebrate thousands of special moments. One of the ways custom rings can be particularly meaningful is to incorporate personal memories into a modern jewelry design. Grandma’s diamond earrings, an inherited emerald necklace, a sapphire purchased on a trip to South America can all be repurposed into a beautiful ring. The ring becomes even more special when a tribute to an important loved one or the memory of a beloved place plays a central role in the design. Jeweler Patricia Daunis-Dunning excels at turning objects of inheritance into unusual and creative rings, such as the stunning wedding ring set she and her late husband, Bill Dunning, created from family jewelry. 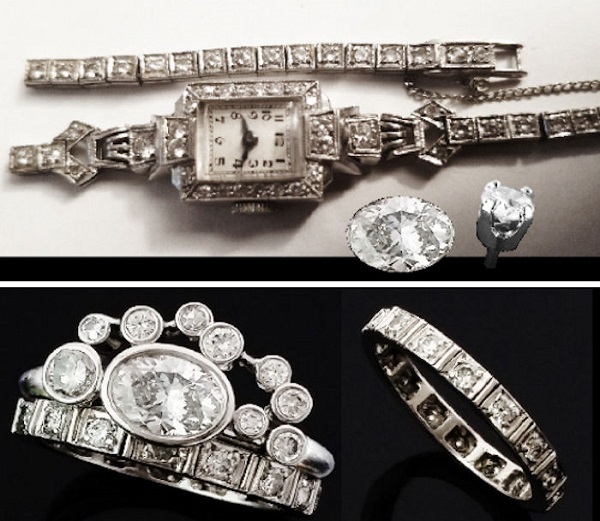 Patricia and Bill extracted diamonds from a watch the groom inherited from his great-grandmother and from earrings the bride’s father had given her. They combined these with a new oval diamond to fashion a highly personal set of rings that carry forward memories of the family into the modern day. Inherited pieces of jewelry became the source and inspiration for a customized set of wedding rings created by Patricia Daunis-Dunning and Bill Dunning. Women are lucky – they often are given beautiful earrings, necklaces, bracelets and rings as tokens of love and affection. But jewelry as an expression of love doesn’t have to be limited to women. Rings in particular lend themselves just as well to men as to women. Certainly, many men sport a traditional gold wedding band, but today fine art jewelers are creating all sorts of designs for men that would make the perfect token of friendship, appreciation and love. Jeweler Edward Spencer is a master at designing rings for men. Spencer has been creating custom jewelry since the early 70’s, working out of Skylight, his gallery and studio in downtown Boston. He uses a wide range of metals and stones to fashion rings that display a sleekness, heft and style well suited to a male aesthetic and a larger hand. He believes that jewelry is a wonderful way to express the personality of the wearer, and he designs each piece three-dimensionally, taking into consideration how it will work on its owner. “As well as being an expression of my art, my jewelry needs to be comfortable and work for its wearer,” Spencer says. Edward Spencer’s rings for men use a wide variety of metals and stones. More than anything, a custom ring lets your own creativity shine. There are no restrictions on the shape, size, metals, colors, and stones you can use. All these options may feel overwhelming, but a skilled custom jeweler can guide you through the process. He or she can help you define the ideas you want to express in the ring, the memories it will carry, the colors, shape, and size that will best suit your loved one, and – not to be overlooked – make sure the ring is at a price that fits your budget. An artistic and experienced jewelry designer can meld all these requirements into a ring that is utterly original and just right. A good way to start thinking about designing a custom ring is to find jewelers whose work appeals to you and your loved one. Does a more traditional style ring seem like the right choice? Or is avant-garde more the style? Should metal be the predominant element, or should precious stones take center stage? Can the jewelry repurpose pieces you already have? Making a survey of the options presented by high-quality custom jewelry designers will help you focus on the individual who can best interpret your creativity in a beautiful ring. 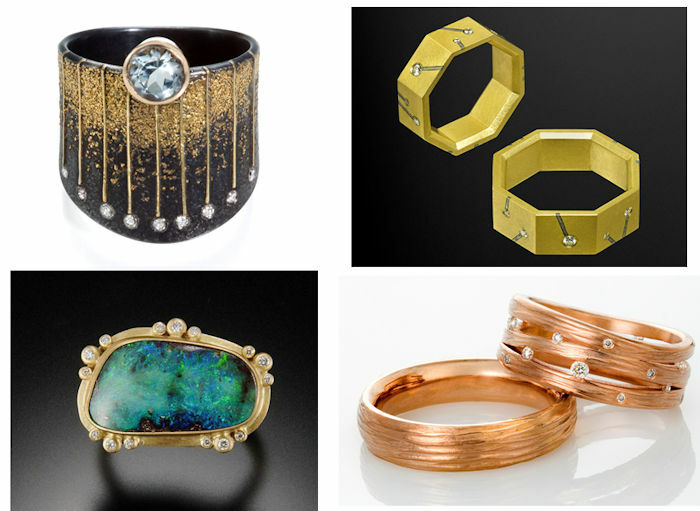 Custom rings can combine all sorts of metals and stones into unusual, personal designs. Top row, left to right: Tai and Tiara Kim – 24k gold, silver, aquamarine, diamonds; Jacob Albee – Octagonal rings in 18k gold, with Gibeon Meteorite inlay and diamonds. A great place to start exploring the world of custom rings is at the upcoming Paradise City Arts Festival, May 25, 26 and 27 at the Three County Fairgrounds in Northampton, MA. All of the jewelers featured here will be showing at this festival, along with hundreds of skilled artists working in every media from paintings and photography to outdoor sculpture, fiber arts, ceramics, glass and handmade furniture. There’s even an exhibit at the show, Fully Engaged!, that will open your eyes to ideas for wedding celebrations and special gifts. Click here for more information on the show, including hours, location, admission and exhibitors. Or, buy tickets here. Hope to see you there!